Android is a mobile operating system which is found on a variety of modern devices, the most popular being smartphones. It is a Linux kernel-based system that’s been equipped with rich components that allows developers to create and run apps that can perform both basic and advanced functions. 2) What Is the Google Android SDK? Android software development is the process by which new applications are created for the Android operating system.A software development kit that enables developers to create applications for the Android platform. The Android SDK includes sample projects with source code, development tools, an emulator, and required libraries to build Android applications. 3) What is the Android Architecture? Android is architected in the form of a software stack comprising applications, an operating system, run-time environment, middleware, services and libraries. Android Debug Bridge (adb) is a versatile command-line tool that lets you communicate with a device (an emulator or a connected Android device). It’s a “bridge” for developers to work out bugs in their Android applications. ART (Android RunTime) is the next version of Dalvik.Dalvik is the runtime, bytecode, and VM used by the Android system for running Android applications. 8)What is an Android manifest file? The manifest presents essential information about the application to the Android system, information the system must have before it can run any of the application’s code. It is a key file that works as a bridge between the android developer and the android platform. It is responsible to protect the application to access any protected parts by providing the permissions. It also declares the android api that the application is going to use. It lists the instrumentation classes. The instrumentation classes provides profiling and other informations. These informations are removed just before the application is published etc. Android Intent is the message that is passed between components such as activities, content providers, broadcast receivers, services etc. There are two types of intents in android: implicit and explicit. A Service is an application component that can perform long-running operations in the background, and it does not provide a user interface. A service is a component that runs in the background to perform long-running operations without needing to interact with the user and it works even if application is destroyed. IntentService is a base class for Services that handle asynchronous requests (expressed as Intents) on demand.Service is a base class for IntentService Services that handle asynchronous requests (expressed as Intents) on demand. Clients send requests through startService(Intent)calls; the service is started as needed, handles each Intent in turn using a worker thread, and stops itself when it runs out of work. AsyncTask is an abstract Android class which helps the Android applications to handle the Main UI thread in efficient way. AsyncTask class allows us to perform long lasting tasks/background operations and show the result on the UI thread without affecting the main thread. A content provider manages access to a central repository of data.Content providers can help an application manage access to data stored by itself, stored by other apps, and provide a way to share data with other apps. They encapsulate the data, and provide mechanisms for defining data security.One of your classes implements a subclass ContentProvider, which is the interface between your provider and other applications. 14)What is the lifecycle of an Activity? 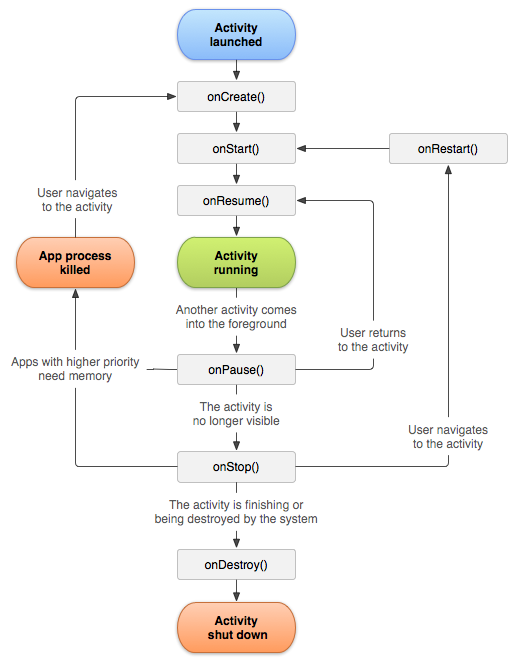 An activity is a single focused thing that the user can do.An activity represents a single screen with a user interface just like window or frame of Java.Android activity is the subclass of ContextThemeWrapper class. Called when the activity is becoming visible to the user. Followed by onResume() if the activity comes to the foreground, or onStop() if it becomes hidden. Called when the activity will start interacting with the user. At this point your activity is at the top of the activity stack, with user input going to it. Always followed by onPause(). Called as part of the activity lifecycle when an activity is going into the background, but has not (yet) been killed. The counterpart to onResume(). When activity B is launched in front of activity A, this callback will be invoked on A. B will not be created until A’s onPause() returns, so be sure to not do anything lengthy here. 15)What is an Adapter in Android? An Adapter object acts as a bridge between an AdapterView and the underlying data for that view. The Adapter provides access to the data items. The Adapter is also responsible for making a View for each item in the data set.The Adapter is actually an interface. 16)Why cannot you run standard Java bytecode on Android? Android uses Dalvik Virtual Machine (DVM) which requires a special bytecode. Java class files convert into Dalvik Executable files using an Android tool called “dx”. The Dalvik Virtual Machine (DVM) is an android virtual machine optimized for mobile devices. It optimizes the virtual machine for memory, battery life and performance. Multiple class files are converted into one dex file. 17. What is the difference between a regular .png and a nine-patch image? The nine patch images are extension with .9.png. Nine-patch image allows resizing that can be used as background or other image size requirements for the target device. The Nine-patch refers to the way you can resize the image: 4 corners that are unscaled, 4 edges that are scaled in 1 axis, and the middle one that can be scaled into both axes. 18. What are the different storage methods in Android? Store private primitive data in key-value pairs. Store private data on the device memory. Store public data on the shared external storage. Store structured data in a private database. Store data on the web with your own network server. 19. What is an ANR notification in Android? 20.Which dialog boxes can you use in your Android application? 21.How can ANR be prevented? Bundles are generally used for passing data between various Android activities. It depends on you what type of values you want to pass, but bundles can hold all types of values and pass them to the new activity. A service is a component that runs in the background. It is used to play music, handle network transaction etc. Service are part of the application and run on a different thread in the background and supports some long-running operation, such as, handling location updates from the LocationManager as in the case of My Runs. Typically, services operate outside of the user interface. 24.Service Runs on which thread? In Android, a Service is an application component that can perform long-running operations in the background on the UI thread. By background, it means that it doesn’t have a user interface. A Service runs on the main thread of the calling Component’s process by default (and hence can degrade responsiveness and cause ANRs), hence you should create a new Thread to perform long running operations. A Service can also be made to run in a completely different process. Allows apps or services associated with an app to inform the user of an event.The Notification.Builder provides an builder interface to create an Notification object. Content providers are used to share information between android applications. A content provider component supplies data from one application to others on request. Such requests are handled by the methods of the ContentResolver class. A content provider can use different ways to store its data and the data can be stored in a database, in files, or even over a network. Fragment is a part of Activity. By the help of fragments, we can display multiple screens on one activity. NDK stands for Native Development Kit. By using NDK, you can develop a part of app using native language such as C/C++ to boost the performance. APK is a short form stands for Android Packaging Key. It is a compressed key with classes,UI’s, supportive assets and manifest. All files are compressed to a single file is called APK. 31.How to pass object using intent? 32.How to Bound Service / how to bind service with activity? A bound service is the server in a client-server interface. A bound service allows components (such as activities) to bind to the service, send requests, receive responses such as data. Volley is a library that makes networking for Android apps easier and most importantly, faster. It manages the processing and caching of network requests and it saves developers valuable time from writing the same network call/cache code again and again. Broadcast Receivers are used to receive events that are announced by other components. For example, activities or other Android components can register for a specific Broadcast Receivers. Receivers that registers will receive intents when other components issue sendBroadcast(). 37.Call GUI by using service? Use a bound service which enables the Activity to get a direct reference to the Service, thus allowing direct calls on it, rather than using Intents. Use RxJava to execute asynchronous operations. If the Service needs to continue background operations even when no Activity is running, also start the service from the Application class so that it does not get stopped when unbound. 38.Android application to be only run in portrait mode? With android:configChanges="orientation" you tell Android that you will be responsible of the changes of orientation. android:screenOrientation="portrait" you set the default orientation mode. A Pending Intent is a token you give to some app to perform an action on your apps’ behalf irrespective of whether your application process is alive or not. Serialization is a mechanism of converting the state of an object into a byte stream. Deserialization is the reverse process where the byte stream is used to recreate the actual Java object in memory. This mechanism is used to persist the object. The ContentResolver decides which provider to use based on the authority part of the URI.Whenever you want to use another content provider you first have to access a ContentResolver object. This object is responsible for finding the correct content provider. The Content Resolver includes the CRUD (create, read, update, delete) methods corresponding to the abstract methods (insert, query, update, delete) in the Content Provider class. Content Values is a name value pair,used to insert or update values into database tables.ContentValues object will be passed to SQLiteDataBase objects insert() and update() functions. Cursor is a temporary buffer area which stores results from a SQLiteDataBase query. FragmentManager which is used to create transactions for adding, removing or replacing fragments. With FrameLayout we can handle fragments as we need at runtime, but to do it we need a manager, in other words a component that can handle fragments. This is FragmentManager. This component can add, replace and remove fragments at runtime. FragmentTransaction gives us methods to add, replace, or remove fragments in Android. It gives us an interface for interacting with fragments. The method commit() schedules this transaction, this is not instantaneous; It is scheduled on the main thread to be done when the thread is ready. Shared Preferences allows activities and applications to keep preferences, in the form of key-value pairs similar to a Map that will persist even when the user closes the application. A task is a collection of activities that users interact. Normally when user launch an application a new task will be created and the first activity instance is called root of the task. 49.What is launch modes for activity? This is the default launch mode of an activity .It creates a new instance of an activity in the task from which it was started. Multiple instances of the activity can be created and multiple instances can be added to the same or different tasks. Views are a class in the Android UI framework. They occupy a rectangular area on the screen and are responsible for drawing and handling events.An activity determines what views to create (and where to put them), by reading an XML layout file. The android.widget package contains a list of most of the UI view classes available to you. 51.Difference between padding and layout_margin? The difference is that padding determines space within the boundaries of the view, and layout_margin determines the space outside the boundaries of the view. 52.How do the XML Layouts relate to the Java Activites? After you create your XML Layout you need to associate it with your activity. This is done in the onCreate method of the Activity using the method setContentView. You pass a reference to the layout file as R.layout.name_of_layout. 53.What is the R Class? When your application is compiled the R class is generated. It creates constants that allow you to dynamically identify the various contents of the res folder, including layouts. 54.What is the methodsetContentView do? A FrameLayout is a layout that generally contains one view or overlapping views. Generally, FrameLayout should be used to hold a single child view, because it can be difficult to organize child views in a way that’s scalable to different screen sizes without the children overlapping each other. AsyncTask allow you to run a task on background thread,while publishing result to UI Thread.Async task is a Generic class .Means it takes parameterized types in a constructor.Async calls a onPreExecute() on UI thread while at execution time .To execute background task call doInBackgound() method.To update the UI calls publishProgress() and at the end call onPostExecute . A ViewHolder object stores each of the component views inside the tag field of the Layout, so you can immediately access them without the need to look them up repeatedly. The ViewHolder design pattern enables you to access each list item view without the need for the look up, saving valuable processor cycles. 59.How to pass a data from one fragment to another?